Click on the Blog menu link and read through a few of my Leadership and Life Journal postings. 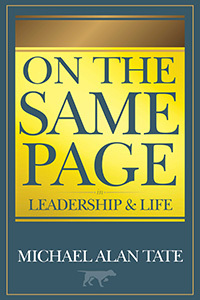 Download and read my complimentary e-book On the Same Page in Leadership and Life. Reading takes about 10 minutes, and you’ll get the link to the e-book through email when you answer three questions below. These pieces will help you better understand my philosophy, personal mission and vision – which will give you insight into whether I would be the right choice for you. Your answers to the questions will also help me understand what you are seeking so that my resources can be better designed to meet your needs. Security Note: Your information will be kept in confidence. Nothing will ever be shared with anyone. What is your level of experience with an executive coach or a professional career advisor? NOTE: This is optional. You don't have to request contact to receive a link to the free ebook. What’s next? When I receive your conversation request, I will get back to you within 24 hours via the manner you indicated. We will arrange a 30-minute phone appointment to discuss your situation, goals and how the process could work for you, so you can make a decision when the time is right. I look forward to hearing from you.